I received this postcard in the post today from a friend who looks at this blog. 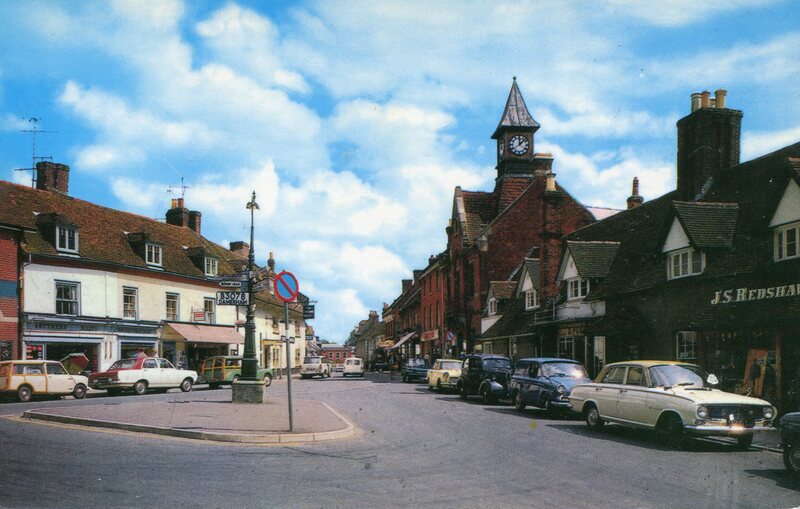 Market Square and High Street, Fordingbridge sometime in the sixties. There are two remarkable things about this photograph. 1) there is not a Volkswagen Beetle in view. Normally you see a street scene from the sixties and you have all the usual British stodge as in this scene and then you notice a Beetle lurking somewhere in the middle distance. 2) The sky. From left to right: BMC Mini Countryman/Traveller, Vauxhall Victor, Morris Minor Traveller, Austin A40, BMC Mini van, Hillman Imp, Triumph Herald, Ford Popular, Commer Cob (i.e. Hillman Minx van), Vauxhall Victor. From down to up: a very smooth road with no markings, the sky. Mm… Yes. Not at all rude. You are right once again. How did i misidentify that?